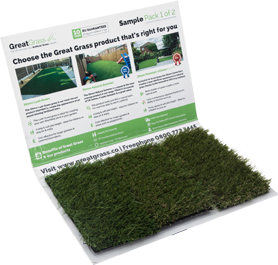 Please complete the following form to receive your FREE samples of Great Grass artificial grass, (we respect your privacy; please see below). You only need to fill this form in once; we will send you all of our samples. Thank you! Unable to place a sample request? There is no need to worry about your privacy; we are people too at Great Grass & we would not like our information sold to anybody; so we will not do that to you either! We secure your personal data using strict security policies & we will NEVER EVER share or sell your data to anyone! Your details will be used purely to complete your sample request and to follow up that you have received them. *On occasions we may contact you for the purpose of checking our service quality.